LEOT is a grass roots charity and our money is spent in Laos. Our only UK costs are our bank charges. Our main spending is on salaries for our Lao school team in Luang Prabang. Our trustees and volunteers are all unpaid. We also receive many gifts ranging from clothing for village projects to computers and equipment for our school. We urgently need more support so that we can guarantee the long term security of our programme and to run many more community projects together with starting a brand new vocational school for young adults who are untrained, unemployed and have no future. LEOT is funded completely by donations from our supporters, partners and trustees. We promise that 100% is spent DIRECTLY on our projects. 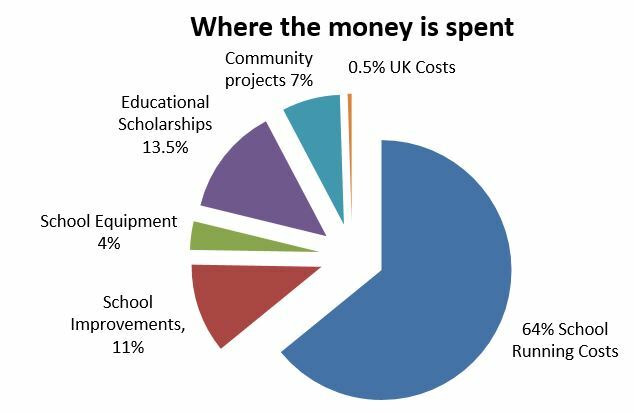 Our pie chart shows our spending for the year ended 30th June 2015.